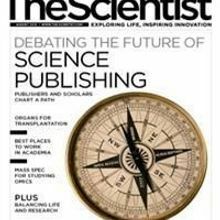 As we stand on the brink of a new scientific age, how researchers should best communicate their findings and innovations is hotly debated in the publishing trenches. Overzealous open-access advocates are creating an exploitative environment, threatening the credibility of scholarly publishing. Grading journals on how well they share information with readers will help deliver accountability to an industry that often lacks it. Ion beams carve slices in frozen cells, giving biologists an interior view. On the 10th anniversary of The Scientist’s survey of life science academics, institutions are contending with tighter budgets and larger administrative staffs, while working to sustain and inspire their researchers. For Michael Dickinson, Drosophila are more than winged gene holders—they’re sophisticated systems for translating sensory information into flight instructions. Innovations in mass spectrometry are making quick, comprehensive, and easy proteome mapping more attainable than ever.